– A long-held dream of wandering around Oz is realised. December in Emerald means its hot, damn hot. But then there are lots of parties with lots of liquid refreshments. And December means lots of work. Work shuts down for 2 weeks over Christmas and the last week was a bit manic trying to get as much done as isn’t possible before we close for 2 weeks. Unlike the past 17 years, I get paid holidays. We have headed way south this year on a big driving trip. First stop after 2 days of driving was Queenbeyan. We stayed with niece Cherie. Rod came over the arvo we arrived and hit us with our Christmas present from he and Brianna. Their present involved a 4.30am start the very next morning. Funny, in a weird way, that on the last day at work we were talking about “out-there” type presents and I spoke about Jan and my wish to go hot air ballooning. 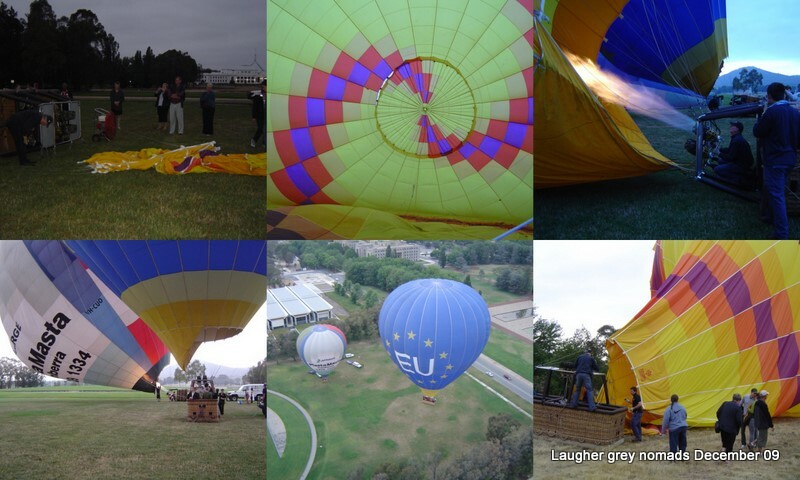 We launched from the lawns in front of old Parliament House, floated for about an hour and landed less than 1Km from where we took off – it was a still morning in Canberra. We got up into the clouds (3000ft) at one stage. Very quiet except when the burners were going. Another item crossed off our bucket list. Thanks Brianna and Rodney, but as I said after the Bridge Climb present, your task is to try and top this. After 2 nights at Queenbeyan we headed south to my sisters place in Boronia, Melbourne where we are having a big family Christmas dinner. We are less than half way through our road trip. So, from Jan and I, all the very best for Christmas 2009. 2009 has been a bit of a challenge for us, on many fronts. We are both looking forward to the new year. Cheers everyone! 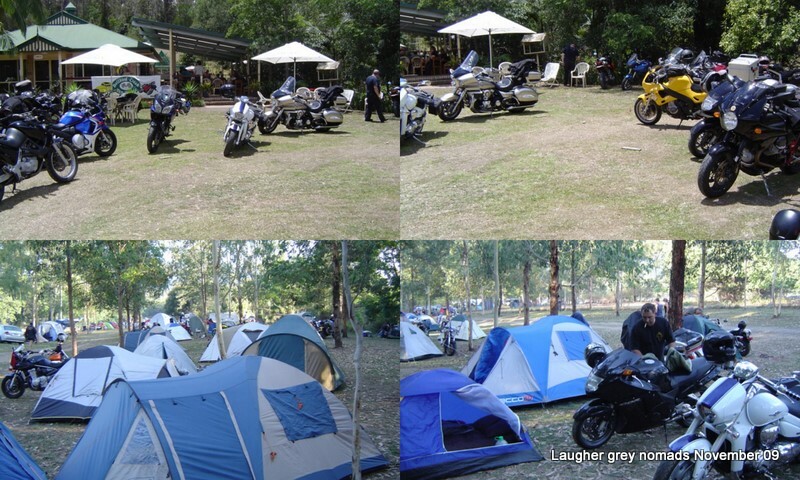 Imbil Deer Farm and Camping Grounds is home to the Imbil Motorcycle Rally. This year was their 20th anniversary. After umming and arring for a few weeks 6 of our group decided with a week to spare to head to Imbil. Imbil is in the hinterland behind the sunshine coast and a “short” 750km cruise from Emerald. So at 6am on the Friday morning of the third weekend of October we headed off. Well Terry, Marc, Noel and I did. Karen and Mick left the day before us, and took a day longer to get home – they are old hands at this rally. Fairly uneventful run down through Biloela, Ganydah and on to Gympie where we stopped to buy a camp chair for Terry and I. And then a 30 km trip to the Rally. I did say the trip was fairly uneventful but I did get a surprise on one fuel stop. I managed to put 19.6 litres into the 20 litre fuel tank. Made me watch the fuel gauge and trip computer a bit closer since. We set up camp and then I got roped in to do a beer run – the Voyager certainly has plenty of storage in the panniers and the top box. There were over 1150 bikes registered for their 20th rally – a new record. A big variety of bikes and a few trikes. About half were Harleys. On the Saturday were went for a ride in the hinterland. Sunday we packed up and headed home, arriving at about 6pm. I was tired, but didn’t have any of the aches that I used to get from the Honda VFR. I really enjoy the cruise control, and its pretty cool to be listening to the radio as I cruise the highway. On the next Tuesday night we headed into Rockhampton straight after work to pick up Brianna from a flight from Sydney. She is between jobs and had conferences in Sydney and then one in Brisbane a week later. So she visited us in the week between. We showed her the Emerald ‘sights’ , had a swim in the dam and talked a bit. She has just accepted a job with the Bureau of Meteorology in Melbourne. The weather for that week was a test for her, with high 30’s everyday only getting down to mid 20’s overnight – welcome to Emerald! I think I have become a little acclimatised – at least my arthritic knees haven’t given me any trouble since we got here. 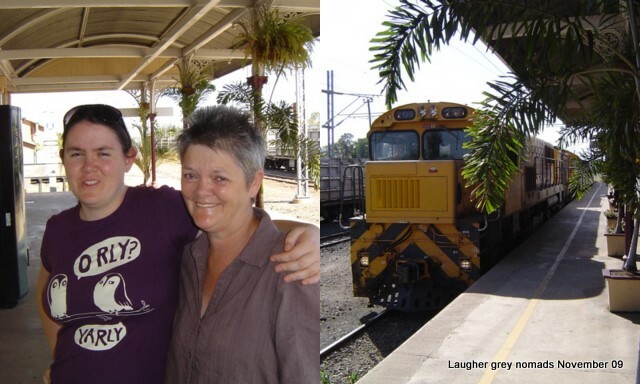 Jan, Brianna and I waiting for The Spirit of the Outback train for Brianna's trip back to Rockhampton for her flight south. Noticed yesterday we have now been 12 months here in Emerald. We will stick here for a bit longer, but are heading south to Melbourne and Gippsland for two weeks over Christmas – my work shuts down December 18th till January 4th.